Are you looking for an original idea for your next anniversary gift? 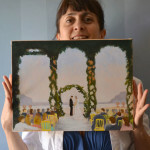 An anniversary painting can really be about anything you loved about your special day. Perhaps it’s the location that you fell in love with, the sunset as you were strolling down a country road or perhaps a silhouette of the both of you in the landscape. Whatever your idea, I’d love to hear all about it and create a personal keepsake painting for you. How a painting commission works? We email regarding what to paint. If you’d like we can also meet on Skype if you prefer. Once we’ve decided on what to paint, I will email you a sketch just so you can have an idea of what your painting will look like. After you’ve approved the sketch, you can make a 50% payment via Paypal. Normally it takes about 3 weeks to complete an oil painting due to drying times between layers of paint. Once I’ve finished your painting, I’ll send you images of it for your approval. Your painting will dry and once it’s ready I’ll ship it to you and send you a shipping notice with tracking number. 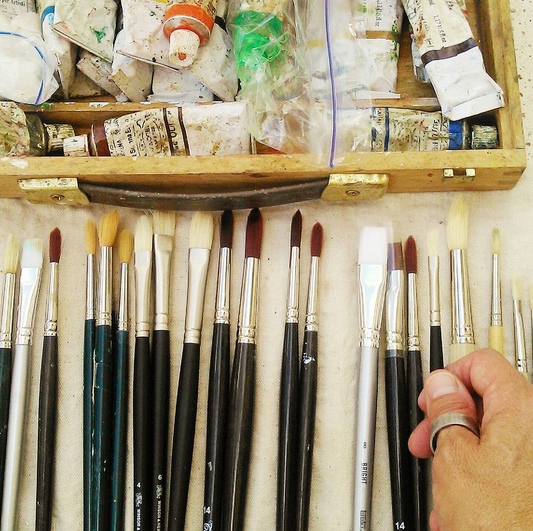 As a professional artist I use only the finest Italian & English oil paints and supports in order to guarantee that your artwork will last for generations. 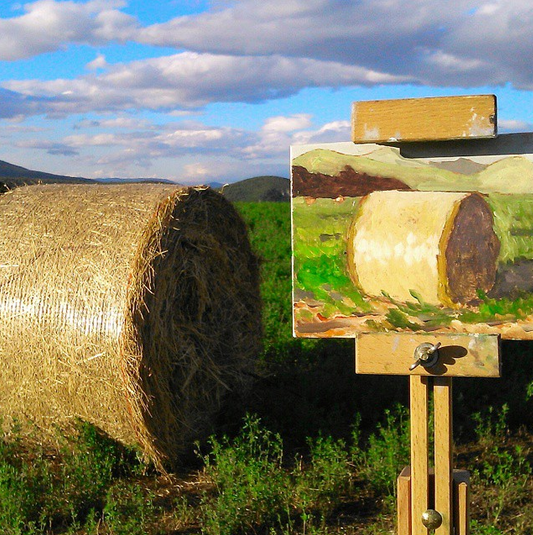 I will provide a Certificate of Authenticity and simple guidelines to care for your painting. My studio is in Umbria, Italy and I ship all my paintings using International Priority Registered Mail which includes a tracking number. Shipping time is 7-18 days depending upon location. If your painting is urgent I can also ship it express so it will arrive in 4-5 days. 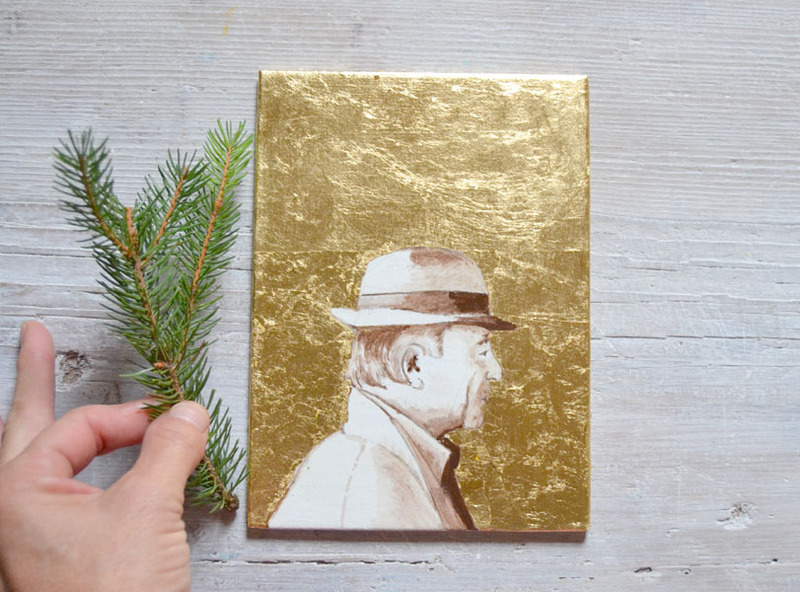 The holidays are right around the corner and this year I’m offering something new: Custom Painting from Photo Gift Certificates . 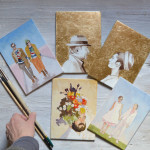 Let’s say you’d like to give a loved one a painting commemorating a special moment in their lives such as a wedding, anniversary, new home or engagement but you’re not quite sure which photo would be the best to be painted. The solution is just so easy: give them a Custom Painting from Photo Gift Certificate so they can choose exactly what they want. And to make it even more special I’m offering FREE INTERNATIONAL SHIPPING when you order by November 30th. Use code: SHIPME15 when you check out. So how exactly does this Gift Certificate work? Your friends/family send me a high quality image(s) of what you’d like for me to paint. We convo about the details including which photo to paint. I paint your friend’s/family’s painting from photograph and send them images for their approval. I’ll ship it once it drie. Other sizes and formats available upon request. 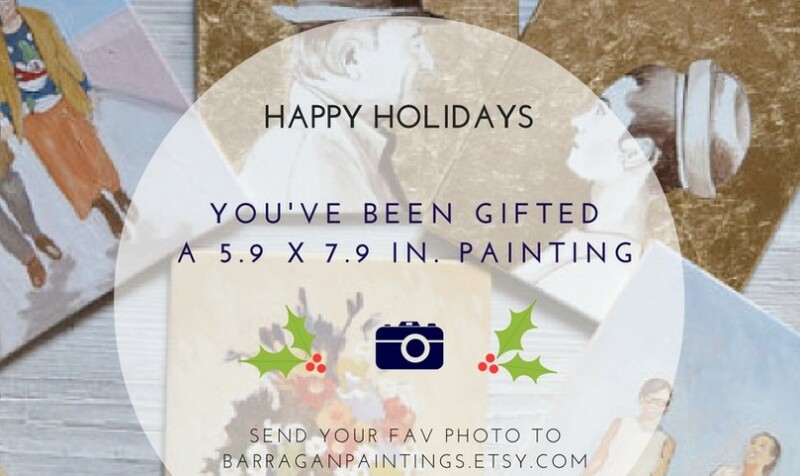 Click here to visit my Custom Paintings Section in my BarraganPainting.etsy.com Shop and if you have any questions please leave a comment below. Thanks! June 2nd is the Festa della Repubblica in Italy, a national holiday to celebrate the birth of the repubblic. 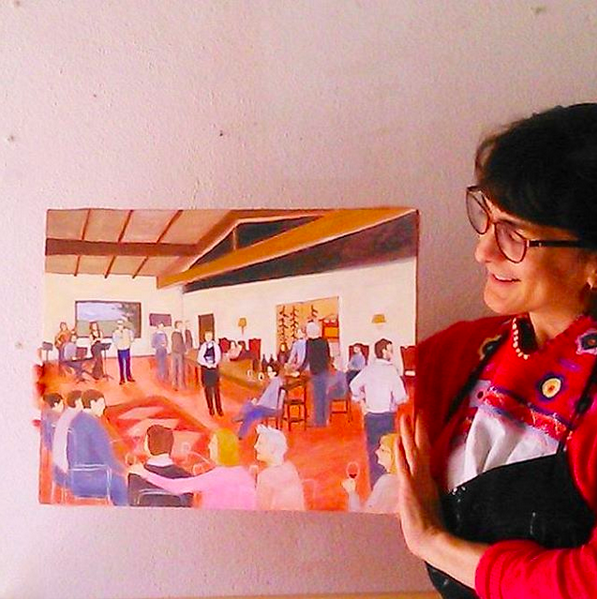 I was invited to do a Live Painting by Brumalia, an Umbrian cultural association that is specialized in experiential tourism & events such as traditional Umbrian cooking classes, winery tours and so much more. 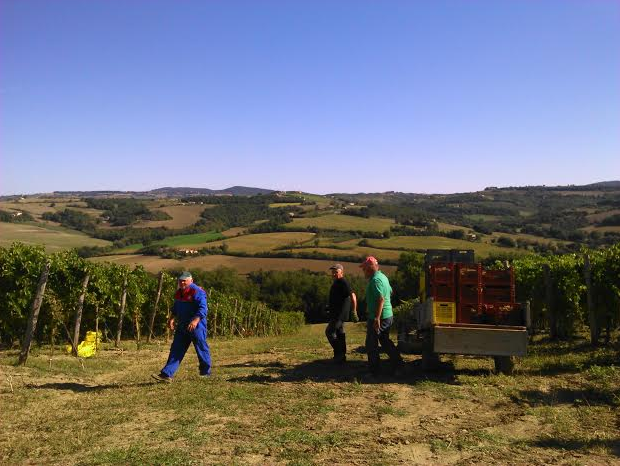 Tenuta Vitalonga is a winery owned by the Maravalle family located in Ficulle just north of Orvieto in Umbria. It’s a boutique winery set in a natural landscape of extraordinary beauty, where the western border of Umbria meets Tuscany. That afternoon they put together a sweet lunch paired with their exquisite wines. 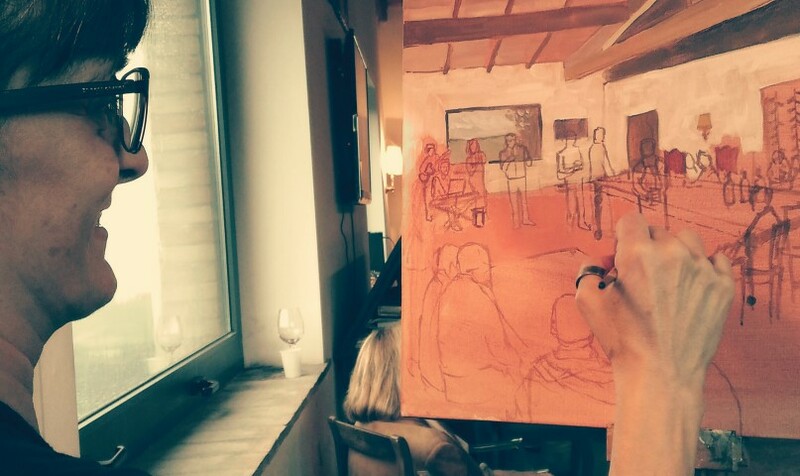 I painted their dessert event and jazz entertainment which included a tasting of their dessert wines. It was an easy going commemorative event with friends and family enjoying a lovely day in an Italian countryside location. I captured the happiness and mood of the day! I bet the majority of you ‘couples to be’ have never heard of what a Live Wedding Painter for Luxury Weddings is or does. You’re not alone. Live Wedding Painting has been on the rise in the United States for the past 8 years as the New York Times has said. However it is a relatively unknown profession in Europe & the UK. 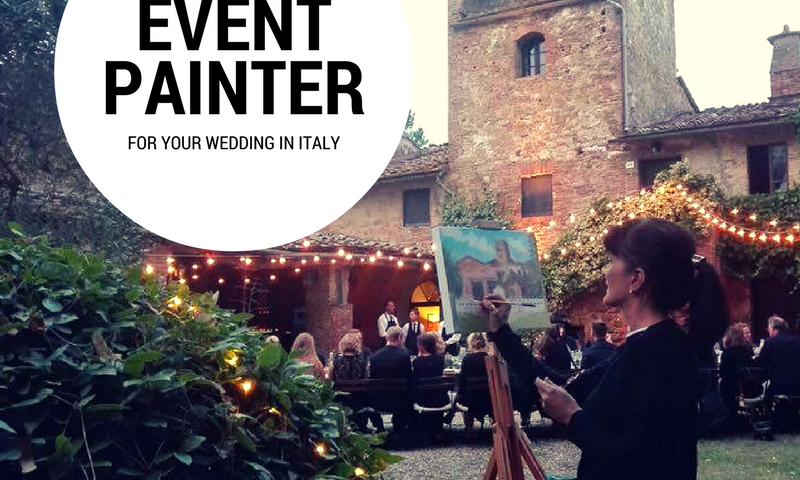 Let’s keep it simple: a Live Wedding Painter is a professional painter that you hire to paint your wedding celebration or reception as it takes place, right before your eyes. 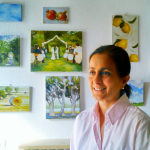 So what are some advantages to hiring a Live Wedding Painter for your wedding? A Live Wedding Painter can paint a scene or scenes from your wedding in such a way as to capture the feeling of your special day. Whether it’s the first dance, the cutting of the cake or the wedding ceremony itself. Once finished, your painting becomes a fine memory of your wedding day and takes you back to the happiest moment of your celebration. 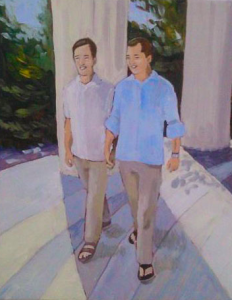 There can be literally thousands of photographs of you taken by friends and family but there will be just one live wedding painting. A Live Wedding Painter adds an original touch of elegance to your wedding entertainment. Many people have never had the opportunity to observe a painting take place. It is something truly magical to see it unfold before their eyes. A Live Wedding Painter arrives at the venue at least 3 hours before the guests in order to start sketching the venue. So by the time guests arrive they can already see the painting start to take shape. 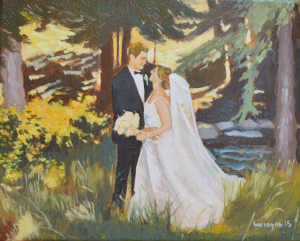 Your Live Wedding Painting will be a keepsake for generations simply because it’s painted with high quality archival materials which mean: professional quality acrylics or oil paints on canvas. 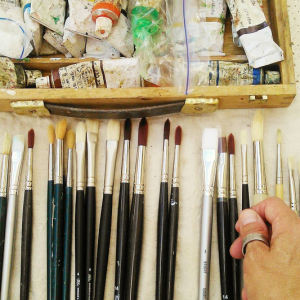 I’ll get into the difference between acrylics and oils in another article. Upon talking with your Live Wedding Painter you can have the freedom to compose and edit in or out guests that you may or may not want in your final painting. For example, you may want the cake table in the same room as the main dance floor or perhaps centrally located. 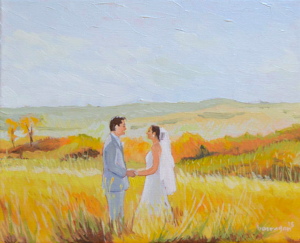 You and your Live Wedding Painter work closely to choose the best possible composition and scene(s) to paint. A Live Wedding Painter always paints people looking happy and with a slight brushstroke they can seem younger or even slimmer if necessary. Live Wedding Paintings are all about elegantly capturing your dreams, your day on canvas while entertaining your guests and creating a one of a kind keepsake memory of your special day. 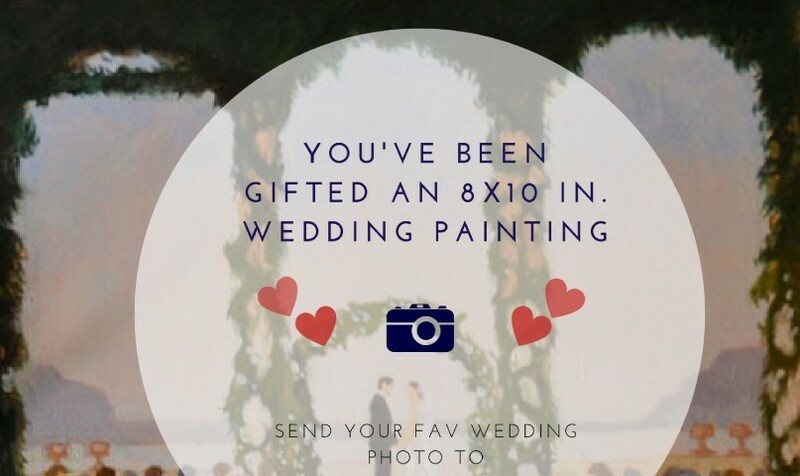 Raise your hand if you’re going to hire a Live Wedding Painter for your wedding in 2016 and leave your comment below. Verni.io is a different artist website. Up until now, art platforms worked like virtual art galleries where artists could showcase their work and the platform would take a fee from any sales made through them. These platforms have gotten big, clogged up and well, it’s difficult to get found. Verni.io has other ambitions. It seeks to connect collectors and artists not just virtually but having potential collectors visit the artist’s studio and buy directly from them. So let’s say you’re visiting a major city or perhaps a farm town (us artists like the boonies!). You can log on to verni.io, enter your location to see which artists are near you, contact them and ask to visit they’re studio. It’s as easy as that. I find this approach humanizing and a great way to meet local artists or international artists like me in their own personal creative space. So if you’re an artist and you’d like to connect with potential collectors, I suggest you join this fun platform. 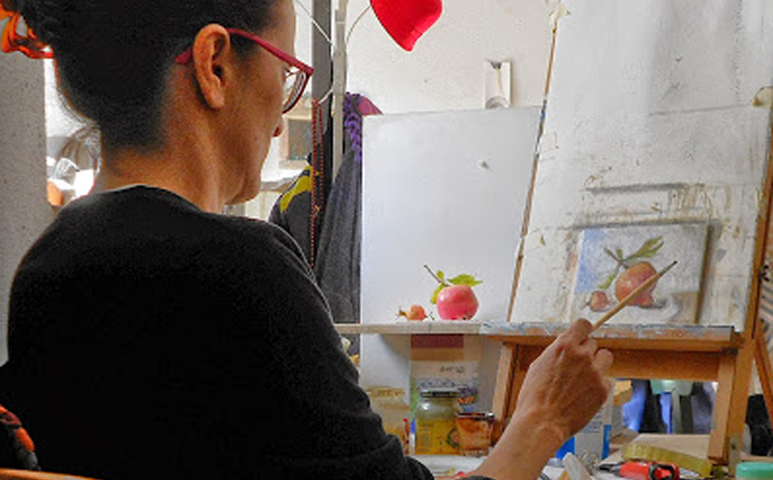 I’m on Verni as Caridad Barragan so if you’re passing through Umbria on your way to Rome or Florence, I’m just 15 minutes away from the nearest autostrada exit, get in touch with me through the platform and come up for a cuppa coffee or tea and visit my studio. If you’ve ever visited central Italy, then I’m sure you’ve been to the Duomo in Orvieto. If you haven’t, you should! 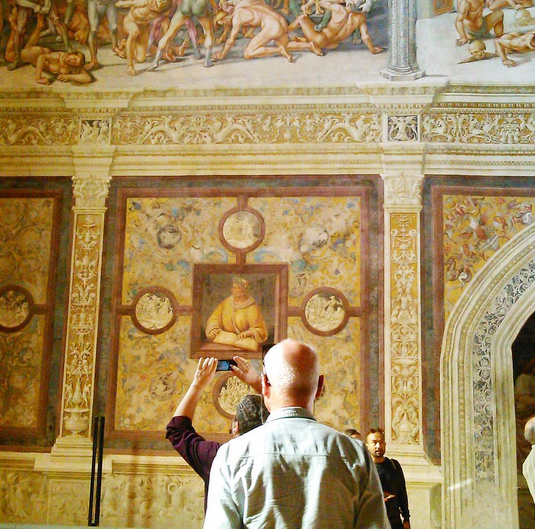 It has some of the most beautiful painted Renaissance chapels in Italy which have been cleaned in recent years. You can find such masters as Gentile da Fabriano, Ugolino, Beato Angelico just to name a few. I went there recently one morning to accompany friends and as I was slowly walking along the side of the central nave and admiring the beauty of it, I noticed these little square paintings on a decorated wall and border. They were small portraits of patrons who had comissioned the work of a side chapel. They were simple and beautifully done using the ‘grisaille’ technique which consists in a painting of a figure painted in grey or neutral tones so as to imitate sculpture and had a gold leaf backgroud that shone warmly. The profile view which was favored in ancient coins was also frequently used in the 15th century Renaissance Italy. 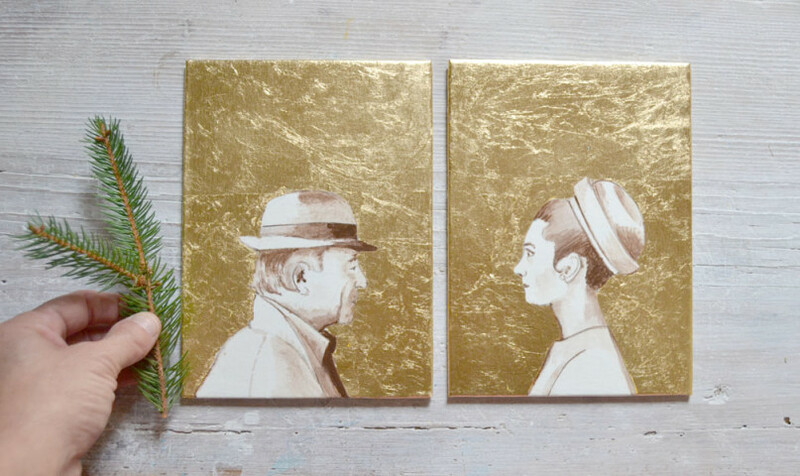 It struck me that these would make lovely contemporary portraits to paint for weddings, anniversaries, grandparents day, father’s & mother’s day or birthdays. So I quickly took out my camera and snaped a photo, went home and drew out my first prototypes and voila: my Custom Profile Portraits for Couples! 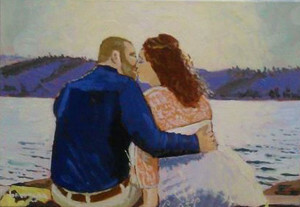 Do you like this couple portrait painting idea? 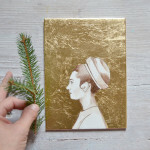 You can order yours in time for the holidays HERE. 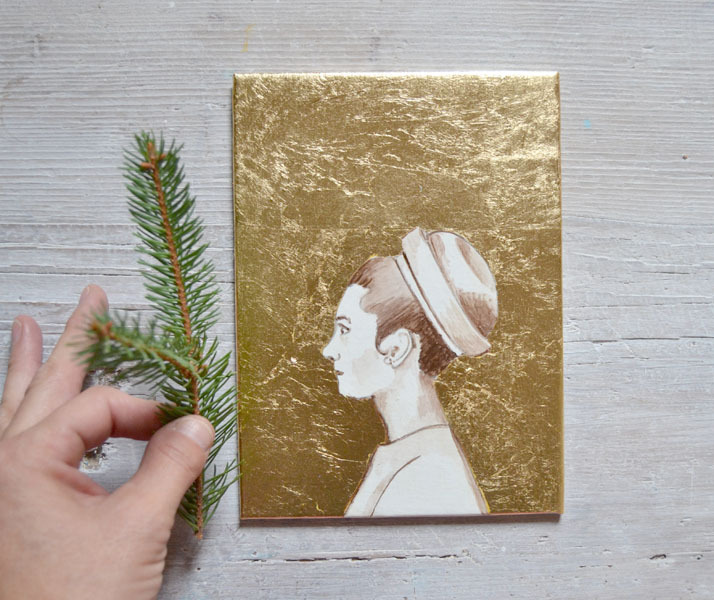 – I carefully draw your portrait onto a finely prepared Italian canvas board. – Once dry, I apply a yellow ochre acrylic background and let dry. 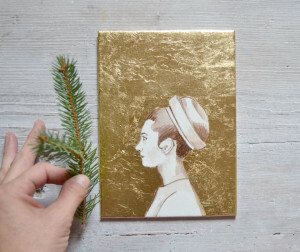 Afterwards the gilding glue and let dry, then eventually the faux gold leaf. – Once the entire painting is dry, I protect it by brushing it over with natural lacquer which seals the surface making it easy to clean and gives it a semi-matte finish. 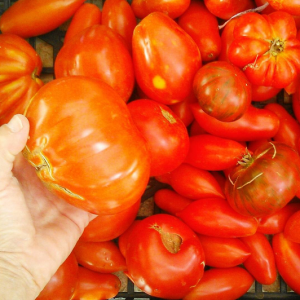 Total production & drying time: 1 week. Shipping time from Italy 5-10 working days. Guess what I’m painting today? 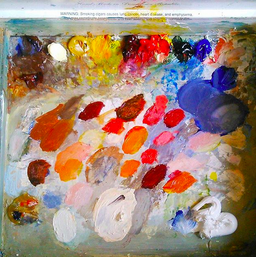 Some people have asked me if I know what I’m going to paint when I sit down at the easel. Well honestly, I don’t always have a set idea. If I’m painting a still life, I prefer to do fruits, veggies or flowers so I simply look around to see what I have in the house. Sure, sometimes I’ll gather something on a walk in the countryside because it has a particular beauty or simplicity and therefore it may end up in a painting. 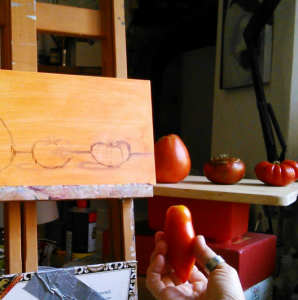 Today’s painting was inspired by my neighbor, Mona’s vegetable garden bounty. She’s quite a buzy-bee and produces all sorts of vegetables of which she brings the seeds down from Denmark. So when I saw her collection of tomatoes, I couldn’t resist. 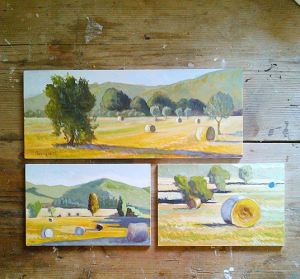 I gathered them up and dashed off to my studio up the street in the small borgo were I live in Umbria. I lined them up as if they were marching and went at them. The first thing to do is decide upon a composition, then proceed to draw it quickly. Just add color after that! Sounds easy doesn’t it? It is if you have a daily practice and have been doing it for many years. 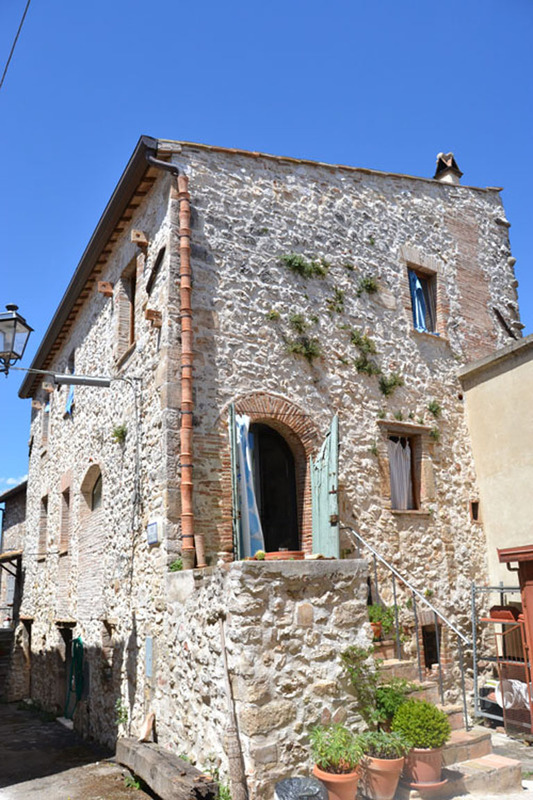 Porchiano del Monte is a small medieval hamlet perched atop a hill overlooking the Tiber Valley. On a clear day, you can see for at least 100 kilometers: Monte Amiata in Tuscany, Montefiascone near Lake Bolsena in Lazio as well as Monte Soratte near Rome. It’s a walled town about 800 meters in diameter which makes it easy to walk around its perimeter. 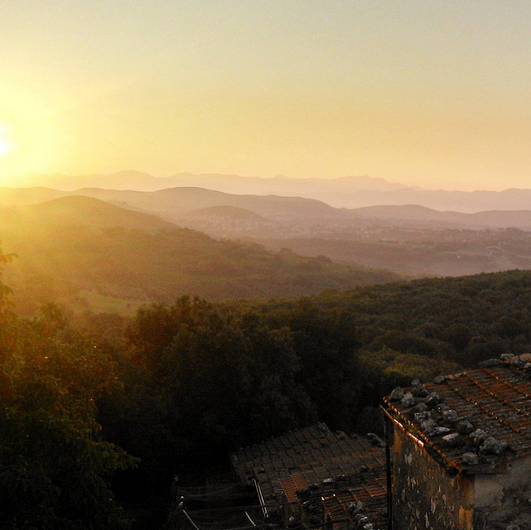 However what makes Porchian del Monte so special is not just the countryside and the spectacular views. It’s the way of life of its inhabitants: life just seems to go by at a much slower, liveable, human pace. It’s no wonder I’ve chosen to live & paint here. What will strike you first is the silence all around. You can hear the wind blow in the trees, the birds singing at dawn and your neighbor walking slowly in one of the vicolo. 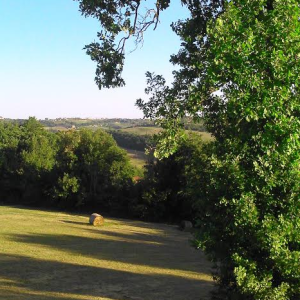 If you’re looking for a place to relax, walk in the countryside, have a picnic in the forest or paint the countryside, then come stay at B&B Barragan. 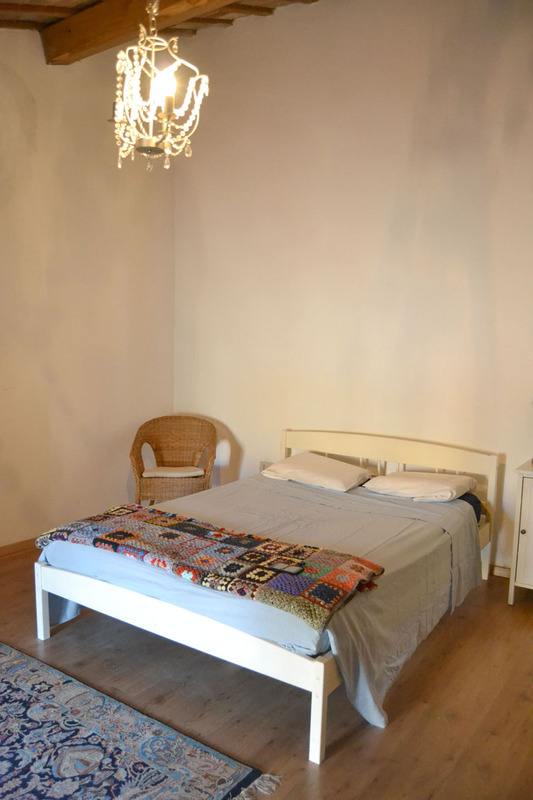 Visit and reserve your room at the B&B Barragan page on airbnb.com. You can paint at any time of day but I prefer to paint outdoors in the early morning or late afternoon. I love the warm glow that hits the side of a tree or a field in Umbria. I like getting up very early, before dawn. I’m a slow riser and love to have a fresh squeezed orange juice, then coffee and something solid before gathering my materials: easel, paints & brushes, turpentine, paper towels and heading to the car and a quick drive down the hill and into the countryside. I never know exactly where or what I’m going to paint. 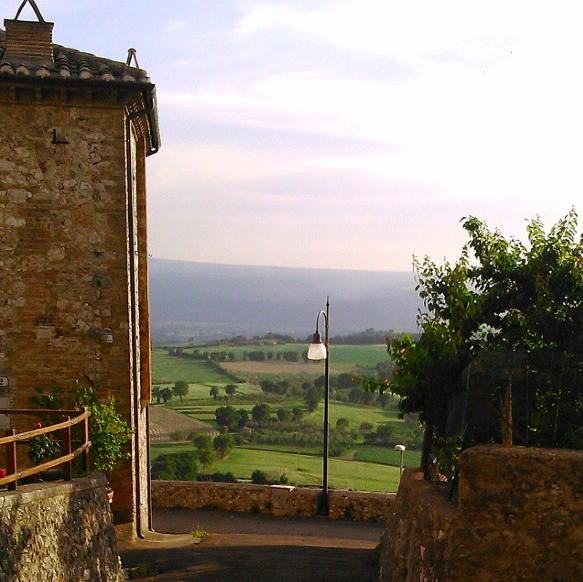 I do have a couple of favorite spots around Porchiano del Monte where I live. I just leave the decision to my mood and nature! 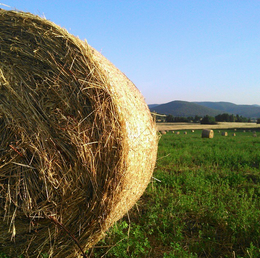 This last summer I really fell in love with hay bales and their round symetrical form and the way that contrasts with the irregular landscape. One of the treats of painting en plein air in Umbria at dawn is that you get to witness the countryside as it wakes up. You can hear different birds take off and start singing, the local fauna stirring about you (just hope it’s not a wild boar!) and a car slowly driving on a gravel path in the distance. I try to paint the peace and tranquility that surrounds me in the Umbrian countryside. Have a look at all my recent landscape paintings here in my Etsy shop. 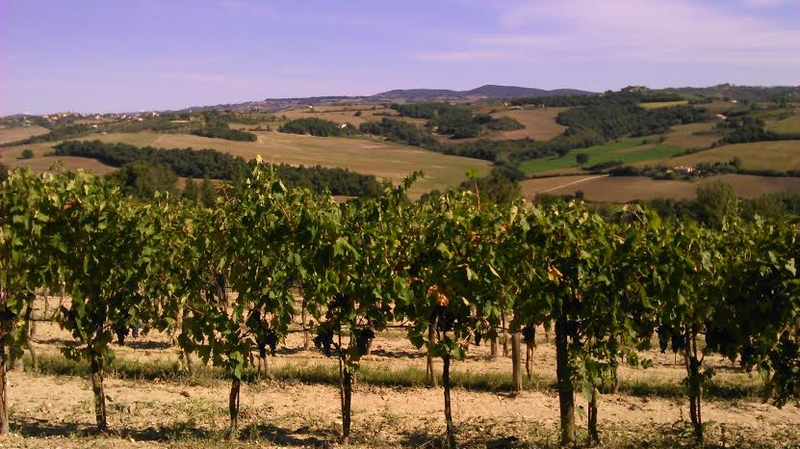 The countryside around Todi is surrounded by endless rolling hills and Roccafiore Wines is cradled among them. It’s a sweet and slow 5 minute drive up the hill to the winery and you can even catch a glimpse of Todi just across the motor way. As a painter, you can’t just trample on someone’s property, and especially not a vineyard in full harvest. I planned ahead and wrote Laura Ferrucci the Hospitality Manager who basically rolled out a little red carpet for me. She set up an appointment to show me the cantina, tell me a little bit about the philosophy behind it and greeted me with warmth and enthusiasm. I had the chance to explore the grounds and find a couple painting places for the next day. 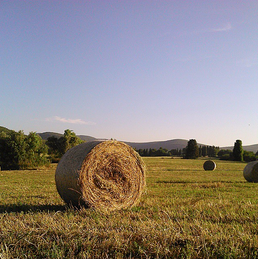 Umbria is always beautiful but it’s particularly magical if you can experience it during one of its harvests and see the transformation of olives or grapes into prime quality products. What really caught my eye about this place was its aesthetic and design, its architecture and landscaping fused together. 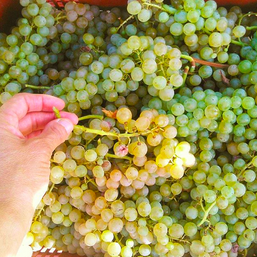 Nothing is left to chance and everything is absolutely beautiful, from the hanging grapes, to the logo, to the farmers harvesting Grecchetto. I woke up very early to get to the vineyards and be “in the field” by 7:30 a.m. The morning light is the best and it moves real quick in the autumn. 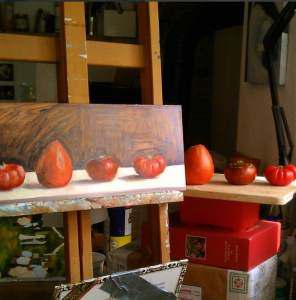 I really liked the perspective that the vines offered so I set up my easel making sure I wasn’t in anyones way, especially the tractor dude that would come by every so often and pick up the harvested grapes. The pickers, which are local farmers that live in the area and work seasonally for the cantina were really amused by my presence as was I by theirs. They had never seen a painter in their field before and were pretty happy to catch a glimps of my painting while it was developing. I really enjoyed painting en plein air in these Umbrian vineyards, the cool morning breeze, the sweetness of the farmers and knowing that I too was contributing to the harvest (in my own little way of course!). 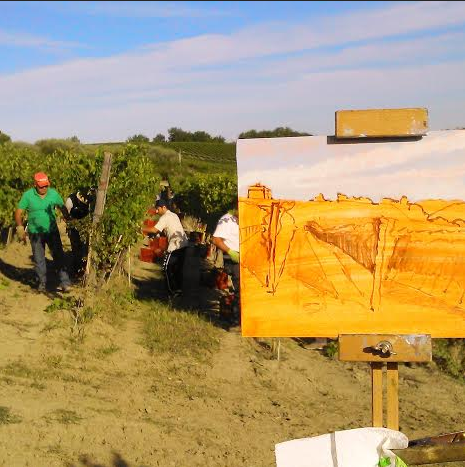 Would you like to paint a wine harvest or olive harvest in Umbria, Italy? Contact me below. A special thanks to Alessandra at Discovering Umbria Tours in Todi for having introduced me to Laura Ferrucci at Roccafiore Wines.